A similar pattern of almost exponential growth continued here until 1898, when a total of 22.1 million tons of grain were shipped from the harbor, a record that would stand for another 14 years. With this amount of grain local and accessible, flour milling became a major industry in the state. Virtually every stream with suitable waterpower sites spawned flour mills, and by 1870 over 500 of them operated in Minnesota. 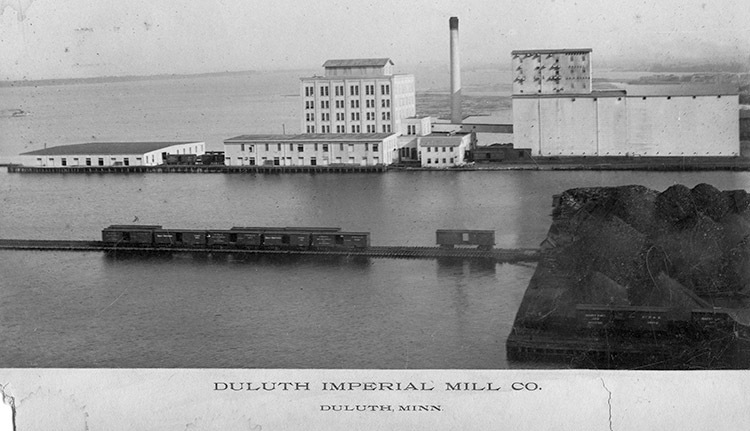 Although Minneapolis became Minnesota’s undisputed center of flour operations, milling remained an important local industry for many towns well into the twentieth century—including Duluth and Superior. 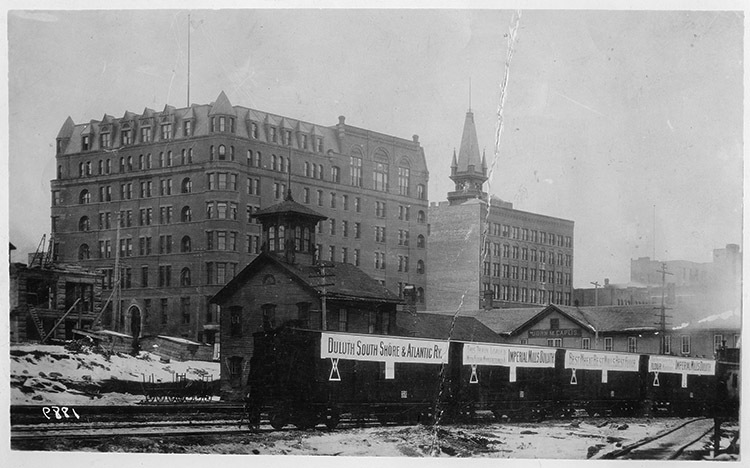 In the late 1890s, one Duluth flour milling company made plans to sell its products not just by the bushel to the local market, but by the train load to eastern cities including Chicago, Cleveland, Pittsburgh, Buffalo, and New York City. That company, the Duluth Imperial Mill, required many special “flour trains,” often made up of brand new railroad cars supplied by the railroads specifically to carry the flour. Each of these trains—sometimes 36 cars long—carried roughly 7,200 barrels of flour valued at approximately $35,000—nearly $1 million in today’s dollars. The railroads likely provided the cars because they greatly benefitted from the deal. Railroads were paid about $3,500 to move a flour train, and since the flour was handled as a single unit—without transfer of cars along the line—only the engine or caboose needed to be changed as the train rolled off of one railroad and onto the next. This kind of special handling kept the trains intact and switching delays to a minimum, resulting in little or no damage claims. This system proved highly efficient. Flour trains leaving Minnesota could get nearly anywhere in the country in just three to five days. This eliminated any intermediate warehousing, further saving costs. This made certain brands of flour fresher and less expensive. In effect, the flour trains of the 1890s were true unit trains consisting of a single product that provided just-in-time (JIT) delivery of crucial goods. Both of these modern transportation concepts—single commodity unit trains and JIT—were developed well over a hundred years ago for the grain trade. The flour mills and railroads both understood the importance of a good public image, so boxcars used to transport the flour were especially clean or in new condition. But the railroads and mills wanted to expand their market, so they came up with an idea to help them advertise to virtually anyone along the railroad tracks who might happen to see a flour train. Standard boxcars of the day were typically painted a drab boxcar red or brown color with simple white lettering. Dozens of plain brown freight trains might pass through a community each day. Flour trains were made up of these cars too, but to make things far more eye-catching the exterior sides of each car was adorned with its own unique banners and slogans. When multiple cars were combined into a train, each car’s banner made up part of a complete statement. For example, one such special 20-car Northern Pacific train of 4,000 barrels of Duluth Imperial Flour left Rice’s Point for New York City on March 19, 1895 with a complete message on it that said: (car 1) 4,000 (…2) BARRELS (…3) DULUTH (…4) IMPERIAL (…5) FLOUR (…6) SOLD (…7) TO THE (…8) PEOPLE OF (…9) NEW YORK CITY (…10) WHO (…11) KNOW (…12) GOOD (…13) THINGS (…14) WHEN (…15) THEY (…16) SEE THEM (…17) AND (…18) ALWAYS (…19) GET THE (…20) BEST. These “slogan trains” helped usher in a new era of railroad advertising. Soon all manner of goods were identified on the sides of rail cars using bright colors, fancy slogans, and detailed artwork. From a physical standpoint the Duluth Imperial Mill was a distinctive six-story brick structure located on the east side of Rice’s Point, smack-dab in the middle of Elevator Row. The mill building and its nearby low level warehouse were built on wooden piles driven in 1888. During its heyday the mill and warehouse were painted bright white, symbolizing the harbor’s aspirations to become a leader in the flour milling industry. The mill quickly added Elevators 4 and 5 for grain storage. These structures were positioned directly next to each other just inland of the mill itself. (Later elevator construction kept plenty of space between these kinds of structures to minimize damage in the event of fire in any one of them.) Elevator 4, the northern-most of the two, boasted a 1,000,000 bushel capacity while Elevator 5 could hold 700,000 bushels. The first railroad to build a single track to serve the mill was the St. Paul & Duluth Railroad (later, Northern Pacific, then Burlington Northern, and today BNSF). The Imperial Mill was closed in 1905 thanks to nationwide consolidation. The mill was sold to the newly formed Capitol Elevator Company under the condition that the building would never again be used for the “handling or production of flour.” So Capitol operated the grain elevators and leased the mill, first to Minnesota Mining and Manufacturing (3M)—which used the facility to manufacture sandpaper—and later to F. A. Patrick Woolen Milling Company. A second rail line operated by the Soo Line (Canadian Pacific today) was later added to the dock, and in 1916 Capitol Elevator Company constructed a modern concrete-and-brick head house and storage building on the east side of the property. This is the oldest, tallest, and most traditional-looking grain structure that remains on the property today. In 1926 Capitol Elevator built two new elevators, Cap 6 and 7, adding 1.75 million bushels to total capacity. Eventually seven surface tracks served the two sides of the Capitol elevators. In 1947 Capitol Elevator was purchased by International Multifoods. Little of the Imperial Mill and the elevators that serve it can be found today. Wooden Elevator 5 was razed in 1977, and #4 went up in flames on January 21, 1978. That same year Annex C-1 was constructed on the exact spot where the Imperial Mill building once stood. This brought total storage capacity up to 4,150,000 bushels. In 1991 Ag Processing, Inc. (AGP) purchased International Multifoods, and in 2008 AGP was in turn purchased by Whitebox Commodities Holdings Corp., operating under the name Riverland Ag. Corp. Ceres Global Ag Corporation purchased Riverland in 2010. The old Imperial Mill property is now part of a system that loads approximately 35 vessels during every Great Lakes shipping season, exporting more than 20 million bushels of grain annually, and the site continues to be a vital part of the Port of Duluth’s long history of shipping grain.